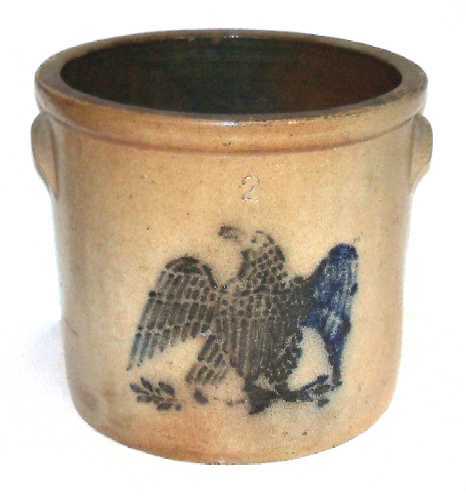 Presented here, a Salt Glazed Stoneware 2-Gallon Crock with Cobalt Eagle decoration. The crock is in very fine condition and is 10 inches in diameter and 9 inches high The only mark is the number "2" above the eagle's head. As you can see in the picture above, the right wing is more blue than the rest of the bird, perhaps due to the positioning of the crock in the kiln. Condition wise, there are a few little "flea bites" on the bottom edge that are mentioned for the sake of accuracy, otherwise all else is good.